This is the fifth in a series of posts on the six-session Software in Astronomy Symposium held on Wednesday and Thursday, April 3-4 at the 2018 EWASS/NAM meeting. Stephen Serjeant (Open University, UK) moderated the fifth session. This session presented different techniques to, for example, study noise in gravitational wave interferometers, select young stellar object candidates, and directly image exoplanets. David Cornu’s (UTINAM, FR) talk, titled Selection of Spitzer YSO candidates using deep learning classifier, included a short tutorial for creating an artificial neural network, showing how a small neuron takes input vectors and updates weights associated with them to understand anti- and co-relation between various factors. Similarly, Carlos Alberto Gomez Gonzalez (U Grenoble Alpes) showed how supervised machine learning can be used to detect exoplanets in his presentation Data science for direct imaging of exoplanets. Other talks in this session included Massimiliano Razzano (INFN, IT), Deep learning to study the noise in gravitational wave interferometers, Sebastian Turner (LJMU, UK) presenting on k-means clustering in galaxy feature data, and Emille Ishida (COIN, FR) presenting for Santiago Gonzalez Gaitan, with Spatial inference of astronomical datasets with INLA. Robert Lyon (UManchester, UK) finished this session with a presentation on Imbalanced learning in astronomy, and provides a Jupyter notebook containing a tutorial and examples. 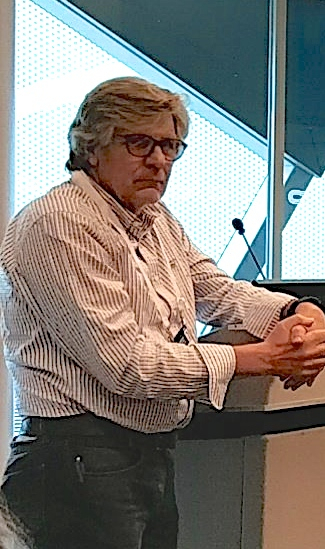 The presentations in this session were accessible even to those with no experience in data mining and machine learning, as the techniques used were explained quickly and well before moving on to how they enabled particular research. This entry was posted in conferences, EWASS, news, people, presentations, special sessions on May 29, 2018 by Alice Allen. 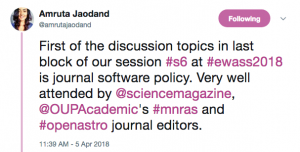 This is the fourth in a series of posts on the six-session Software in Astronomy Symposium held on Wednesday and Thursday, April 3-4 at the 2018 EWASS/NAM meeting. Astronomy leads most sciences in providing many open services, particularly data and ways to get access to and u se data. This session, moderated by Andy Pollock (USheffield, UK), highlighted some of the new and ongoing services available to not just professional astronomers, but also to students and other interested parties. 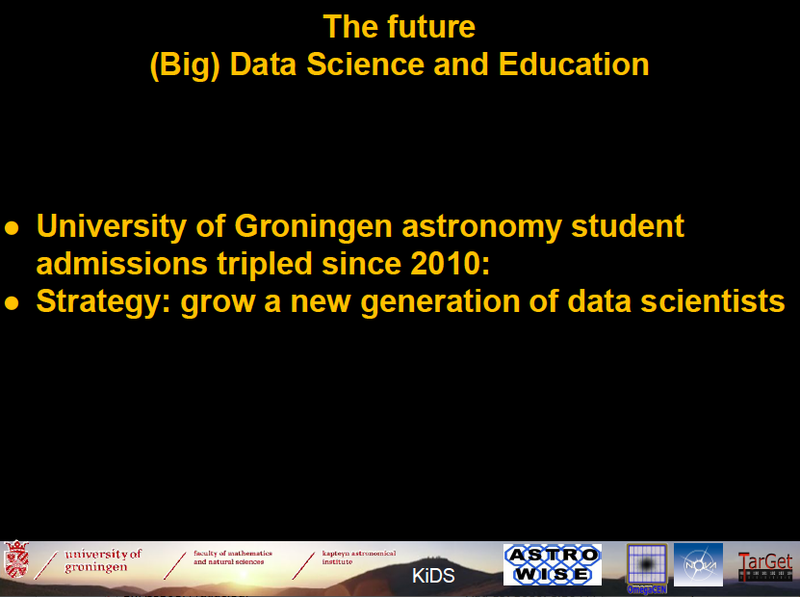 Debbie Baines (ESA, ES) opened the session with her presentation ESASky version 2: the next generation, which included a live demonstration of this incredible resource. ESASky allows searching for any astronomical object and offers viewing it in different wavelengths. It is very fast, too; Baines loaded images from Herschel, XMM, Chandra, and HST in her live demo. It offers relevant links to SIMBAD, such as to papers, and one can pull up research literature from ADS in ESASky, too. Rachael Ainsworth (UMelbourne, AU), originally scheduled to give the first presentation, followed Baines; her presentation, Open Science in Astronomy, gave an overview of openness in astronomy. She pointed out that astronomy is better at open science than many other fields, crediting, among other services, arXiv and GalaxyZoo. 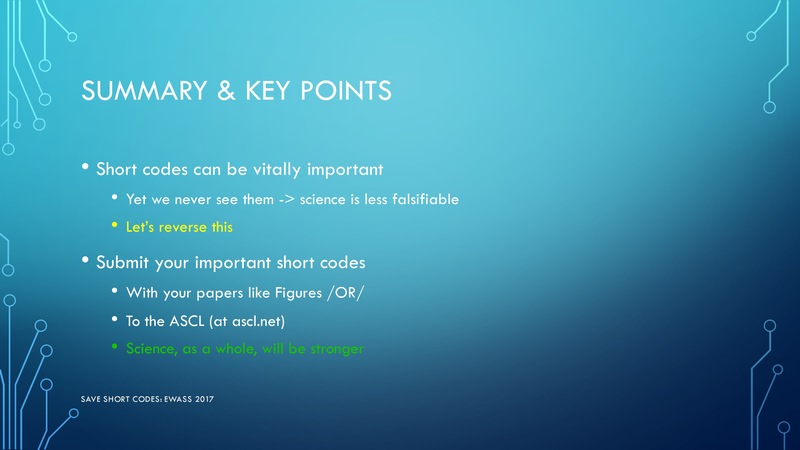 She covered some of the challenges and shared additional resources that support, encourage, or make open science possible. Jorge Palacios (IFAE, ES), in his talk Astronomy in a Big Data platform, discussed two services, Cosmohub, a web portal for interactive exploration and distribution of massive cosmological data, and SciPIC (Scientific pipeline at PIC), software for generating synthetic galaxy catalogs using DM simulations. In An Interactive Sky Map based on the Byurakan Plate Archive, Gor Mikayelyan (BAO, AM) shared that the NAS RA Byurakan Astrophysical Observatory in Armenia is making its plate archive, covering 1947 -1991, available online in the BAO Observational Database, which will have the ability to search and select and will allow downloading the plates in different formats. A sky map will show where plates are available. After the last two talks, The ASI Cosmic Ray Database for charged particles data by Valeria Di Felice (SSDC/INFN, IT) and Using XML and semantic technologies in astroinformatics to manage data by Guy Beech (UHuddersfield, UK), Pollock opened the floor for discussion and asked whether people could do what they’d like to do as efficiently as they’d like. One answer from the audience was no, because the data are heterogeneous and different ways are required to access them. One pointed observation arising from the back-and-forth was that “radio astronomy is decades behind” in terms of software services, with “thousands of different file formats processed by thousands of different programs”. This entry was posted in conferences, EWASS, news, people, presentations, special sessions on May 28, 2018 by Alice Allen. 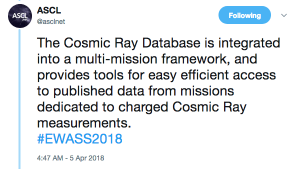 This is the third in a series of posts on the six-session Software in Astronomy Symposium held on Wednesday and Thursday, April 3-4 at the 2018 EWASS/NAM meeting. Amruta Jaodand (ASTRON, NL) moderated the third session of the Symposium, which featured talks on seven different software packages. The first presentation was by Sergio Martin (ESO, CL), on MADCUBA and SLIM: A lightweight software package for datacube handling and spectral line analysis. These software packages offer features for easier use of the ImageJ image processing framework; this framework is widely used in other disciplines for multidimentional images. SLIM provides a synthetic spectra generation and automatic fit to observed spectra; MADCUBA provides an interface to handle and manipulate multiple datacubes, process large datasets quickly, and is scriptable. Alex Hamilton (UHull, UK) presented SunPy the Open Source Solar Physics Library, giving an introduction to the package, which collects, manages, and analyzes data from many solar data sources, and sharing information on its new features and capabilities. As one of this session’s presenters was doubled-booked, we made adjustments to the order of presentations, so The next-generation cosmological code SWIFT was the next talk; this was given by Matthieu Schaller (LeidenU, NL). This package, due for release this summer, uses task-based parallelism for intra-node parallelization; testing has demonstrated that it is more than 30x faster than the code Gadget on representative cosmological problems while using fewer resources. The next talk had generated a lot of interest, as it is not a usual astronomy conference offering. Maisie Rashman (LJMU, UK) spoke about Developing and applying astronomical software for novel use in conservation biology. The team Rashman works on has developed a pipeline using astronomy techniques to identify and track animals; their goal is to create a fully automated system for species identification, population tracking, and combating poaching using drones. After Rashman, Shane Maloney (Trinity College, IE) presented xrayvision – a collection of image reconstructions methods for X-ray visibility observations. 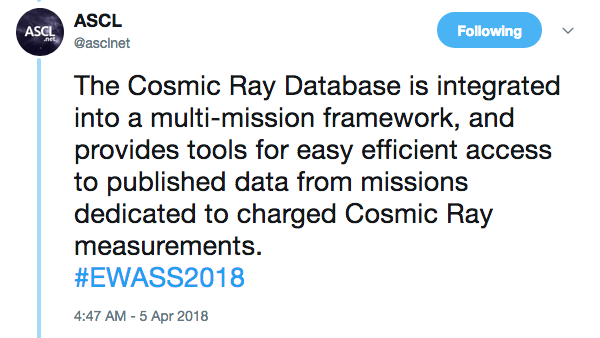 The xrayvision package is built atop other packages, including SunPy, and fills a need for an open-source solution for these observations. One of the project’s goals is to provide access to people in poorer countries to software for solar physics. The cleverly-named software package PampelMuse was presented by its author Sebastian Kamann (LJMU, UK) in his talk Crowded-field 3D spectroscopy with PampelMuse. This Python software performs PSF deblending on the integral-field data; several thousand sources can be deblended simultaneously. The final talk of this packed and fast-paced session was by Matteo Bachetti (INAF, IT) on Stingray, HENDRICS and Dave: Spectral Timing for all. Stingray is an AstroPy affiliated package that merges timing and spectral analysis for X-ray spectral timing. The idea for spectral timing arose in a meeting at Leiden University two years ago, where a team formed and started working on the project; the code is under active development. By combining Stingray with the HENDRICS (for shell scripting) and Dave codes (a GUI atop Stingray), the team will provide the community with a Python API (for the brave), a GUI to ease the learning curve, and shell scripting capabilities for batch processing, for advanced spectral timing with a correct statistical framework. 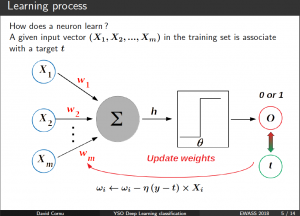 This entry was posted in conferences, EWASS, news, people, presentations, special sessions on May 24, 2018 by Alice Allen. 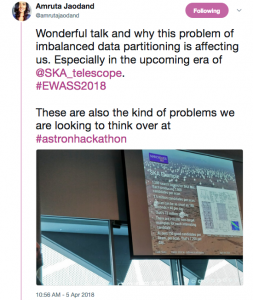 This is the second in a series of posts on the six-session Software in Astronomy Symposium held on Wednesday and Thursday, April 3-4 at the 2018 EWASS/NAM meeting. This session focused on using the available infrastructure to better reward software authors and ways to count these valuable research objects. The software contributions that enable much of the results in astronomy are often not recognized, nor considered for reward or promotion. Unlike most of the other sessions in this Symposium, this session had only three short presentations and devoted the rest of the time to an open discussion and Q&A. The session and discussion period was moderated by Rein Warmels (ESO, DE). Federica Bianco (NYU, US) presented Understanding the Impact of Your Research Software to open the session. 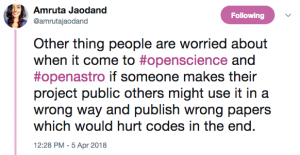 She stated that one should always cite software used in research, but “it’s not always obvious how.” She discussed a finding of Howison and Bullard (2015) in their research on software citation in biology articles: open source software is cited more informally than proprietary software. This means that software authors are not accruing credit for their contributions in a way that academia rewards: formal citations. 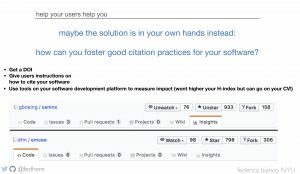 Bianco mentioned Force11, which has published software citation principles, and the now-completed Depsy project, which sought to provide not only citation information on software but also to measure the impact and use of code through other statistics, such as downloads, number of contributors and number of projects reusing the software. 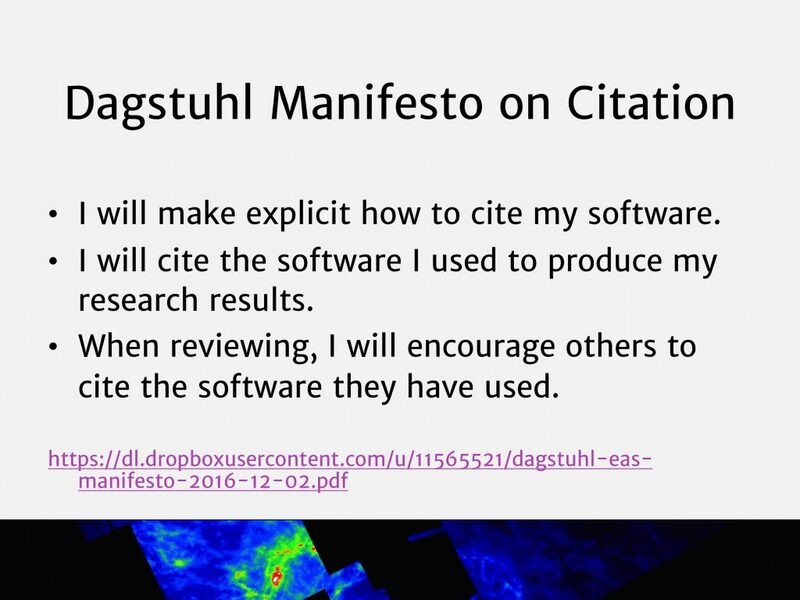 Among Bianco’s suggestions for fostering good citation practices for one’s own software were to get a DOI for it and give users instructions on how the software should be cited. 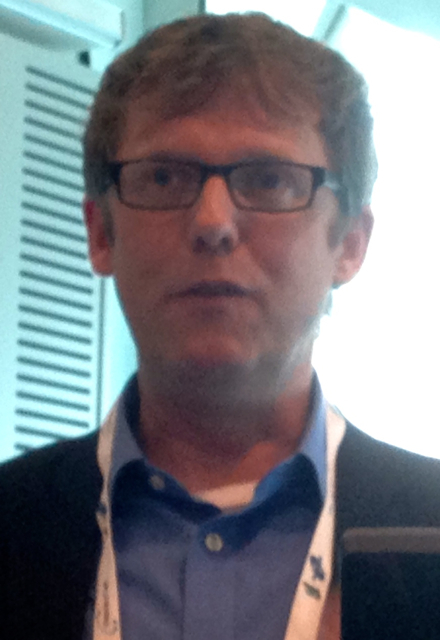 Keith Smith (Science, UK) spoke on Citation of data and software in astronomy: A journal editor’s perspective. Smith said that most scientific advances have their base on previous work, which requires reproducibility. Citations not only enhance reproducibility, they also assign credit. 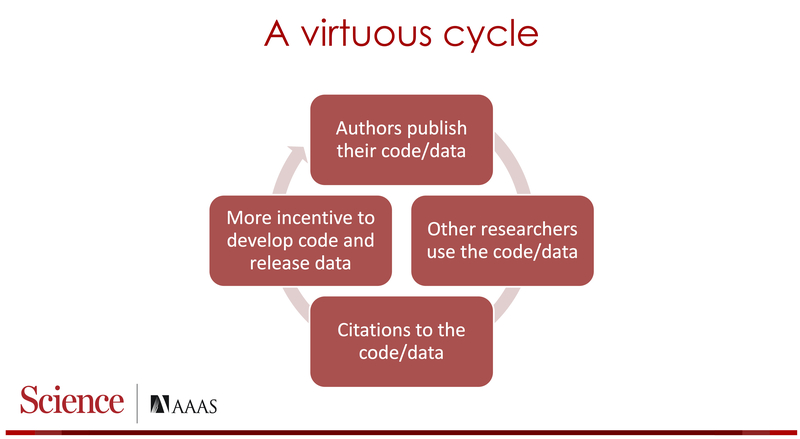 He provided guidelines for citing data and software, sharing bad, better, and good examples, and spoke of a virtuous cycle that will increase reproducibility in addition to the sharing of software and data. 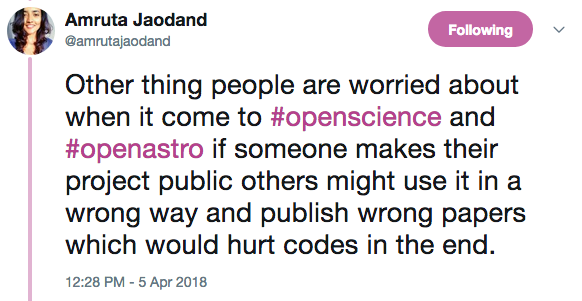 Smith mentioned the Center for Open Science Transparency and Openness Promotion guidelines, a policy framework for journals that was developed with journal and community input, and noted that though over 5,000 journals have signed onto them, none of the major astronomy journals have done so. 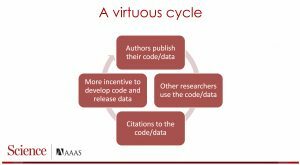 Science’s policies require proper citation of data and software and release of data and software upon publication. Looking forward, Smith sees data and software citation becoming more common, as could be seen with a graph from the ASCL’s dashboard showing the increasing number of citations to its entries, and stated that journals have a role in improving reproducibility and proper citations through policies and editor and referee awareness of changing community standards. and credit, such as CodeMeta, Force11, WSSSPE, the FAIR principles, and DataCite involve those from many disciplines; the sharing of ideas influences not just those involved in the efforts, but has a greater reach with their aspirational and practical goals and guidelines. Allen shared steps code authors can take to increase the probability of having their software cited correctly and steps researchers can take to improve their articles by including citations for the computational methods that enabled their research, and provided a link to resources mentioned in her talk. Rein Warmels then opened the floor for discussion. Someone asked whether GitHub would “be there forever?” The point was made that GitHub is not intended to be an archive, and that other services are, so use them to archive your code. 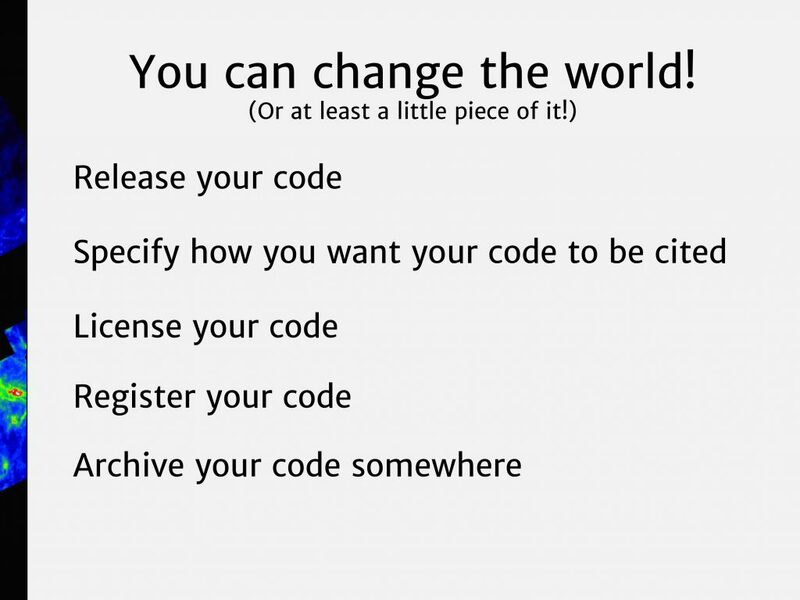 On whether to release software, Smith stated that even horrible to read code is better than no code: “it’s hard, painful, and you may hate someone forever… but that’s better than nothing.” Science can provide software information as a supplement, so that is one way to ensure your software is available to support your research findings. In discussing software citations, All en pointed out that ADS has not been able to automatically track citations to Zenedo DOIs, though that is expected to change soon. 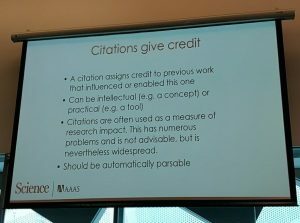 The issue of what exactly to cite also came up – should one cite all the dependencies needed to run a particular research code? 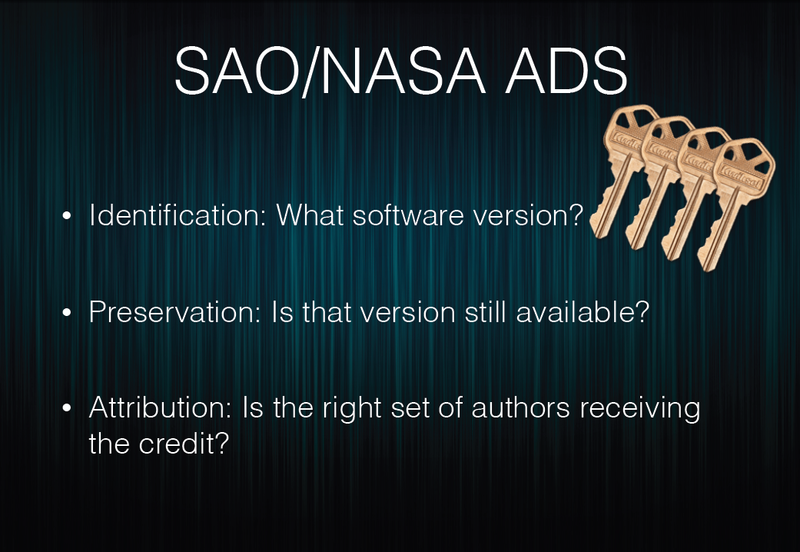 Neither astronomy nor other disciplines have a way to handle this; at this time, the recommendation is to cite the research software you use well so others will know what your work relied on, and leave it to the software sites to identify the dependencies. 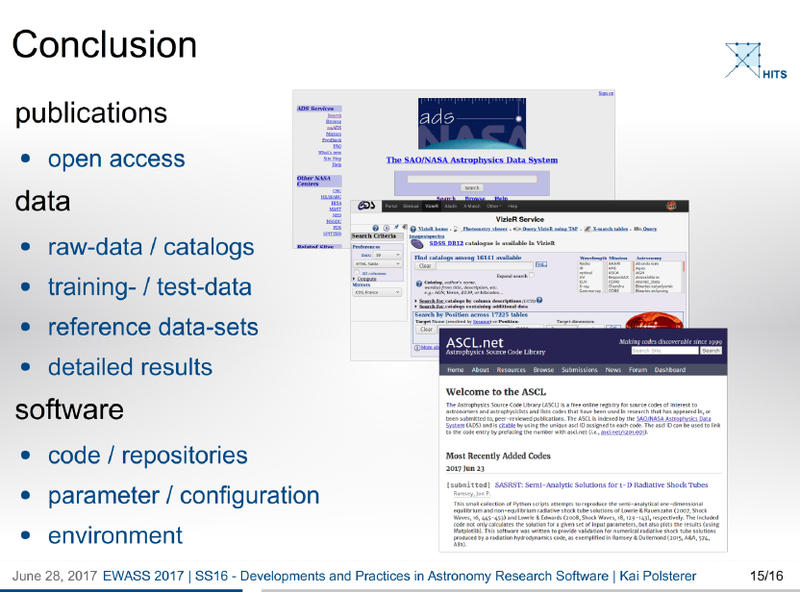 This is the first in a series of posts on the six-session Software in Astronomy Symposium held on Wednesday and Thursday, April 3-4 at the 2018 EWASS/NAM meeting. Each of the six sessions focused on a different aspect of research software, covering not only specific software packages, but also computational techniques used in data mining and machine learning, open services, software development training and techniques, and getting credit and citations for computational methods. Several sessions included a free-form period in which participants could ask questions, discuss issues, and share information. The last session of the Symposium was a lively moderated discussion among attendees with particular interest in software publishing. The first session set the stage for the Symposium, featuring a variety of topics of importance when discussing astronomy research software. Alice Allen (ASCL, US) moderated the session. 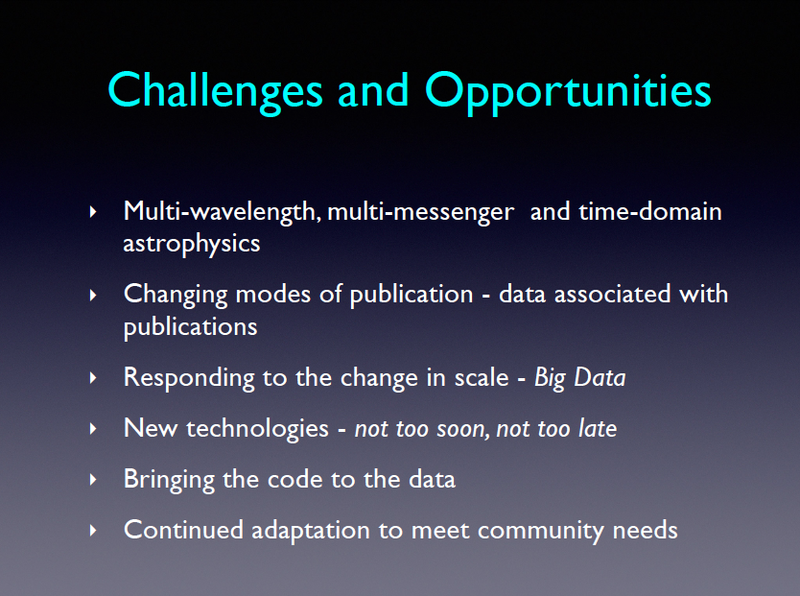 In the inaugural talk, Software Engineers as Partners in Astronomy Software Development, John Wenskovitch (Virginia Tech, US) opened his presentation with a quote by computer scientist and professor Carole Goble, stating that software is “the most prevalent of all the instruments used in modern science.” This was reiterated by others throughout the symposium. 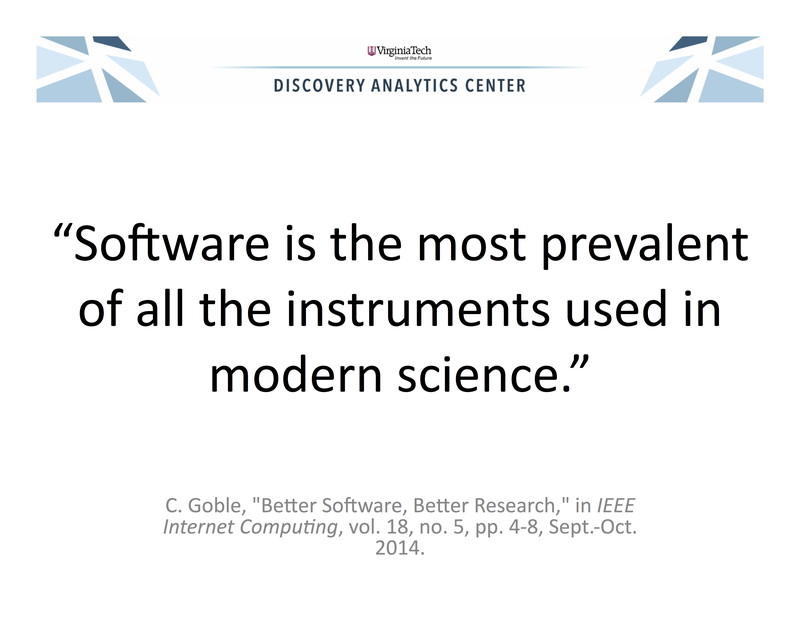 Wenskovitch provided statistics on software use and development activities by academics, among these that 92% of academics use software and 38% spend at least 20% of their time developing software. Research software engineers (RSE) provide guidance to researchers on software engineering and encourage the use of tools that can save academics time and effort in their development efforts. Wenskovitch suggests identifying and using the strengths of each, with the researcher bringing domain knowledge and expertise on the research itself, and the RSE bringing development experien ce and software engineering expertise. 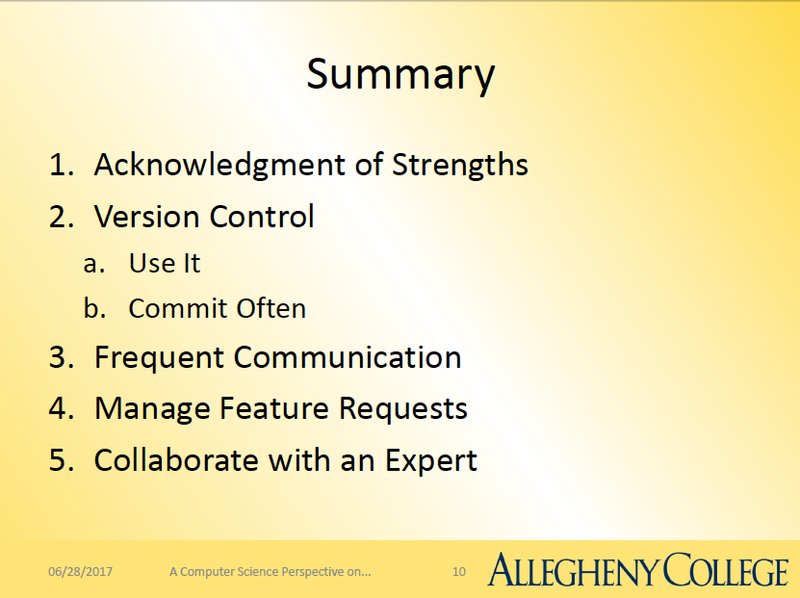 He provided suggestions for ensuring a fruitful partnership; these include using version control, scheduling time for regular and frequent communication, having a prioritized feature list, testing the code thoroughly using unit, regression, and usability tests, and documenting everything. Mark Wilkinson (DiRAC HPC Facility, UK) spoke next, presenting Research Software Engineering – the DiRAC facility experience. The science requirements for DiRAC demand a 10-40fold increase in computing power to stay competitive, and this increase cannot be delivered solely by hardware. Software vectorization and code efficiency is vital, and RSEs are increasingly important to help with, for example, code profiling, optimization, and porting. DiRAC’s three full-time RSEs are embedded in teams, their time allocated through a peer-review process. Wilkinson showed that the use of RSEs has paid off well for DiRAC, with, for one project, a factor 10 speed-up by optimizing a particular code. The focus on software engineering continued with a talk on Software Engineering Training for Researchers delivered by David Perez-Suarez (UCL, UK). He presented information he had gathered by conducting a quick survey to learn, among other things, what software development training researchers had gotten. His recommendations for training include running or attending training taught by The Carpentries, asking that training be conducted in conjunction with a large conference, such as the American Astronomical Society has been doing for several years, checking to see what software training might be offered by your university, creating your own study group, and co ntributing to an open source project. 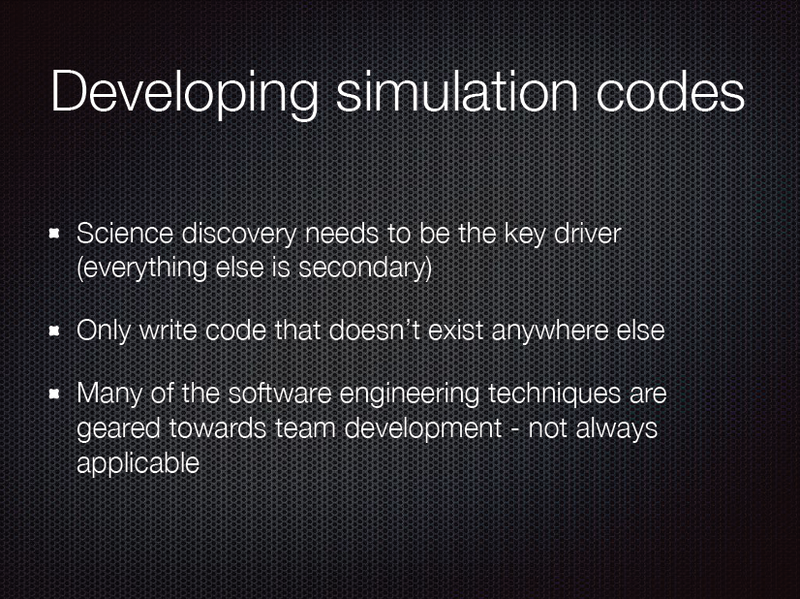 James Nightingale (DurhamU, UK) presented a very interesting talk on Test-driven Development in Astronomy. He convinced many in the room that using this technique for developing software will result in better software and less aggravation when coding. 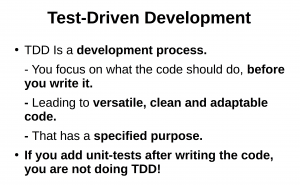 He stressed that test-driven development (TDD) is not a testing process, but a development process, and that the code coming out fully tested is a bonus. 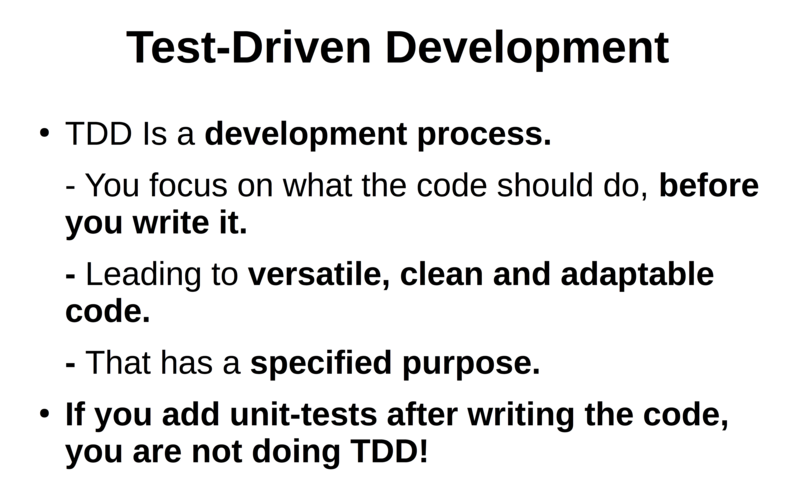 With TDD, the first task is not to write code, but to write a unit test and then run it to ensure it fails. Only after that do you write the code, and then test it. Through refactoring and testing code, you get instant feedback on whether the code’s functionality has changed, and code design becomes part of the development cycle. The last two talks of this first session focused on Python, and covered the growing use of this language in astronomy, the reasons for this growth, the support that is available for the language, and information on one very popular package written in Python. Amruta Jaodand (ASTRON, NL) presented A Walk Through Python Ecosystem, starting with its early development in 1989 by Guido van Rossum at the University of Amsterdam. The advantages of Python include simplicity and natural flow and an extensive, powerful standard library. Strengths of the language include the development of scientific, numerical, and statistical packages and its Python Package Index (PyPi), which enables module and package sharing. Jaodand shared some of the learning materials available for Python, including python4astronomers, and also a lovely Easter egg about Python that is too long to include here and is worth reading. 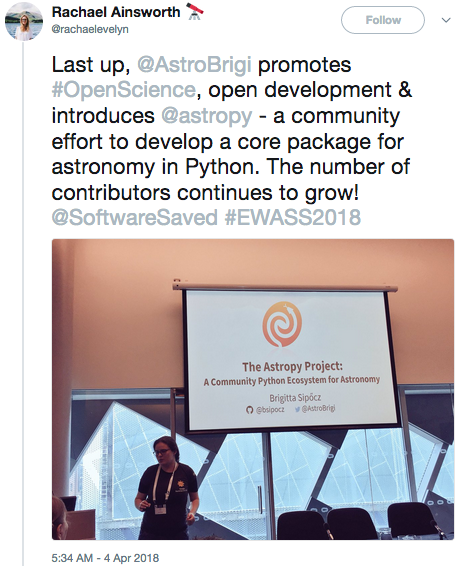 One of the most important astronomy packages is AstroPy, and Jaodand’s talk was followed by The Astropy Project: A community Python library and ecosystem of astronomy packages, presented by Brigitta Sipocz (AstroPy, UK). AstroPy provides software for many common astronomy needs; in addition to the core library, there are many affiliated packages. 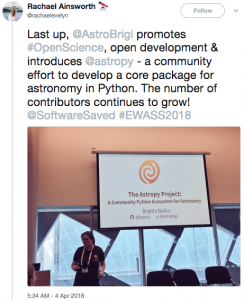 All of these packages adhere to coding, testing and documentation standards that have been developed by the AstroPy coding community. Sipocz also discussed the community, with members of the team having one or more of its many roles. The number of collaborators continues to grow, and the community welcomes new members, and labels packages that are particularly friendly for a new contributor to work on. This entry was posted in conferences, EWASS, news, people, presentations, special sessions on May 23, 2018 by Alice Allen. 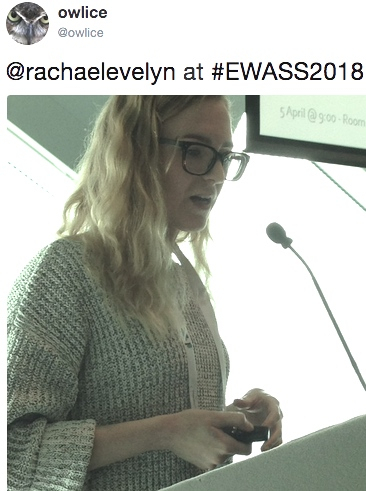 This entry was posted in conferences, EWASS, presentations on April 4, 2018 by Alice Allen. The last session of the Symposium is a Software Publishing Special Interest Group meeting, and will take place on Thursday from 4:30 to 6:00 PM. For more information on this session, including abstracts, check the interactive guide for Symposium S6a – S6f. See you there! This entry was posted in conferences, EWASS, presentations, special sessions on April 3, 2018 by Alice Allen. 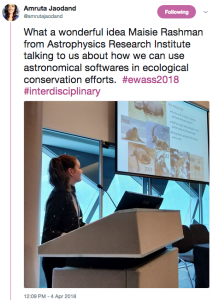 As promised in a previous post, here are a few slides from the second block of EWASS 2017 software presentations. This entry was posted in conferences, EWASS, news, presentations on August 9, 2017 by Alice Allen. Here are a few slides from presentations mentioned in a previous blog post; slides from more of the talks at EWASS will be covered in another post. 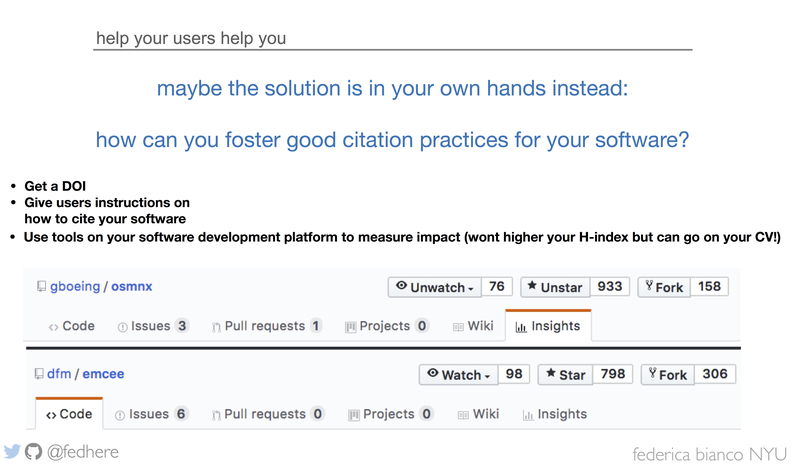 All contributions are made in GitHub repositor(ies). All contributions are reviewed via pull requests. Test suite run using pytest. 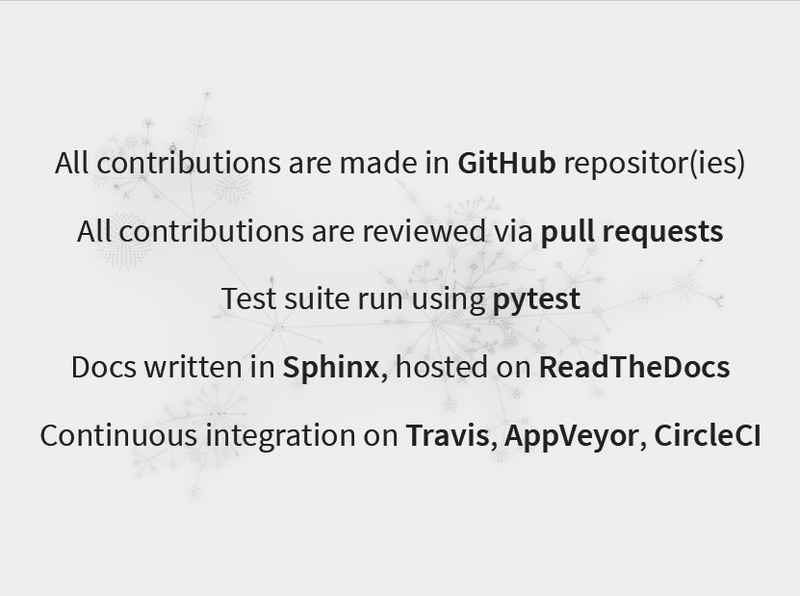 Docs written in Sphinx, hosted on ReadTheDocs. Continuous integration on Travis AppVeyor, Circle CI. Summary: 1. Acknowledgement of strengths. 2. Version control. a. Use it. b. Commit often. 3. Frequent communication. 4. Manage feature requests. 5. Collaborate with an expert. This entry was posted in best practices, conferences, EWASS, news on August 3, 2017 by Alice Allen. Page rendered in 0.530 seconds. Blog powered by WordPress.